New Delhi: Chennai commuters are going to rejoice with the two new major section of Chennai to be open for public. With opening of Chennai Central Metro Station, commuters can take one single train to airport to railway to bus station. This line is going to make life easier for residents and encourage people to opt for Chennai Central Metro over private commuting. The new line was inaugurated on Friday by the chief minister of Tamil Nadu, Edapadi K Palaniswami. Union Minister of State (Independent Charge) for Housing and Urban Affairs Hardeep Puri was also present at the inauguration event and was joined by Deputy Chief Minister O Panneerselvam and Union Minister of State for Shipping Pon Radhakrishnan. In the first stretch the Chennai Metro Station covers Chennai Central to Nehru Park which falls on the Green Line. With this stretch opening work for Central to St Thomas Mount will be wrapped up and made operational for public. As part of the second section, AG-DMS (also known as Gemini) to Little Mount station will be opened for commuters. Both the metro meet Chennai Central Metro Station and now work on remaining stretches falling under Blue Line will have to be wrapped as their status is still under construction. With the inauguration of Chennai Central Metro station all commuters in the city and outside Chennai will now be able board a metro train from either of the city’s outstation termini. These would include –Chennai Mofussil Bus Station (CMBT) at Koyambedu or Central and Egmore – to the outstation bus terminal and also to the Chennai International Airport at the southern end of the city. Moving in line of offering sustainable solutions, the Chennai Central Metro, situated 28m below the ground will be run completely on solar energy. Central Station will also be one of the biggest metro stations, a spot that was till now reserve for Nadaprabhu Kempegowda Majestic Station in Bengaluru as the biggest metro station in south India. Central Metro in totality now occupies 70,000 square meters and is largest metro station in south India. 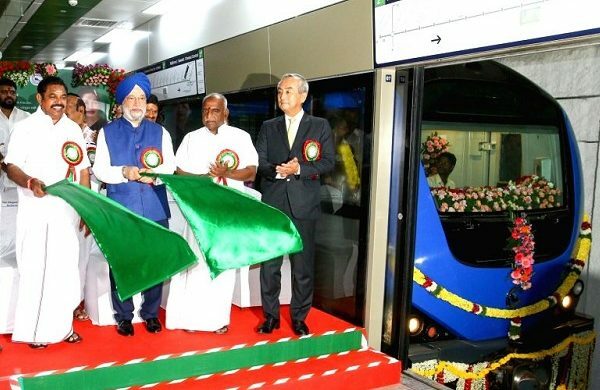 Chennai Metro inaugurated its first segment in 2015 and since then every year it has been opening new section for public. Recently CMRS has given safety certificate for these two sections after final inspection.